le chaudron de vulcain – May 27 , 2018 . EN. Pu’u ‘Ō’ō / Kilauea , Popocatepetl , San Miguel (Chaparrastique) , Piton de la Fournaise . Home / blog georges Vitton / May 27 , 2018 . EN. Pu’u ‘Ō’ō / Kilauea , Popocatepetl , San Miguel (Chaparrastique) , Piton de la Fournaise . May 27 , 2018 . Fissure 22 continues to erupt lava that is flowing southeast to the coast and the lava ocean entry. Fountains at Fissures 6 and 13 feed lava into a channel that reaches the coast forming a second ocean entry. Activity at fissure 6 this morning (May 25, 2018). Lava fountains have built a small spatter cone (black mound) from which lava was spilling out onto the surface and flowing into a small pond (left of the cone). 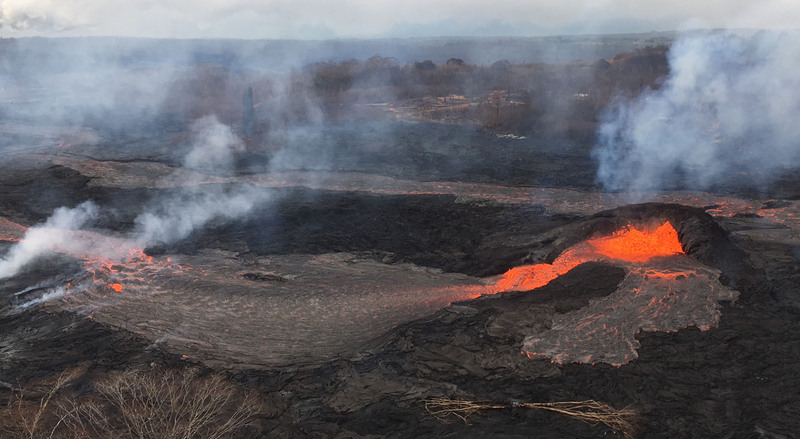 Fissures 7 and 21 are feeding a perched lava pond and pāhoehoe flow that has advanced northeastward covering most of the area between Kaupili and Mohala Streets. The flow crossed Kahukai St. shortly after 3pm and was still the area between Kahukai St. and Pohoiki Rd. at 9:30pm Fissure 17 continues weak spattering, while Fissures 19 and 23 are no longer active. 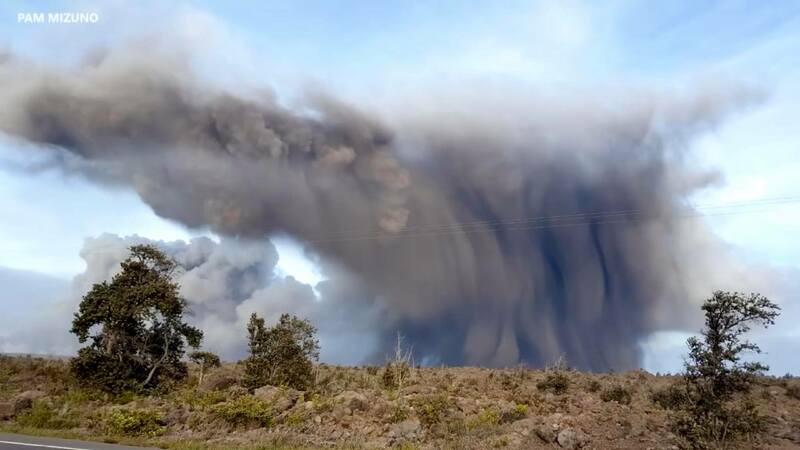 There was an explosion from Overlook Crater at 4:17pm that produced an ash cloud that rose to 12,000 feet above sea level.The National Weather Service Nexrad radar indicated that the cloud quickly dispersed. Many smaller explosions occurred over the course of the day. Moderate trade winds were blowing to the southwest and light ash fall likely occurred in downwind locations. Earthquakes in the summit area were happening at a high rate today, with 8 earthquakes greater than M3 being located, the largest of which was M3.99. Many more small quakes occurred between the larger events. The earthquakes and ash explosions are occurring as the summit area subsides and adjusts to the withdrawal of magma. Fissures 7 and 21 are feeding a perched lava pond and pāhoehoe flow that has advanced northeastward covering most of the area between Kaupili and Mohala Streets. The flow front has become an ‘A’ā flow and is advancing slowly toward Pahoa Pohoiki Road. The latest observations indicate the flow front is about 150 yards from the road. On the west side of Fissure 7 a perched pāhoehoe flow (near Makamae St) broke out around 04:00am feeding short flows to the west. 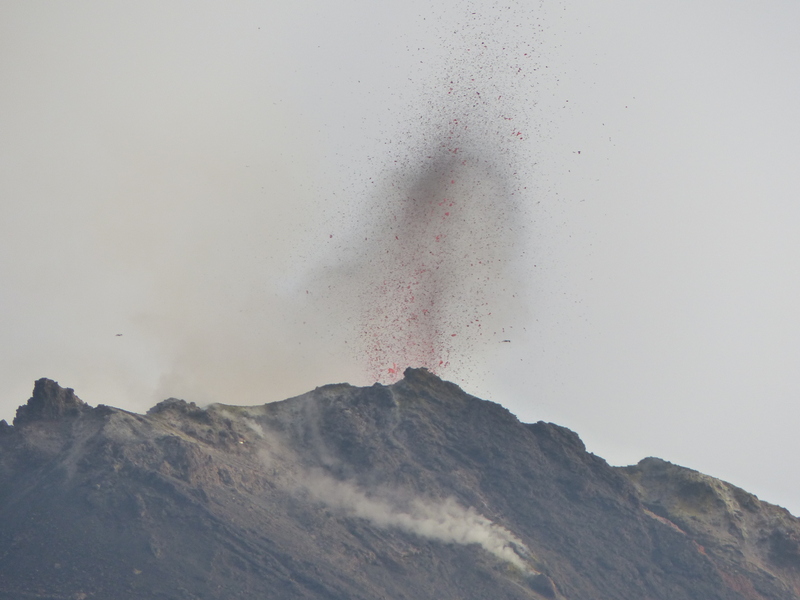 Overnight, flaming and vigorous spatter was observed from a cone on Fissure 8, while Fissure 17 was the source of multiple booming gas emissions. 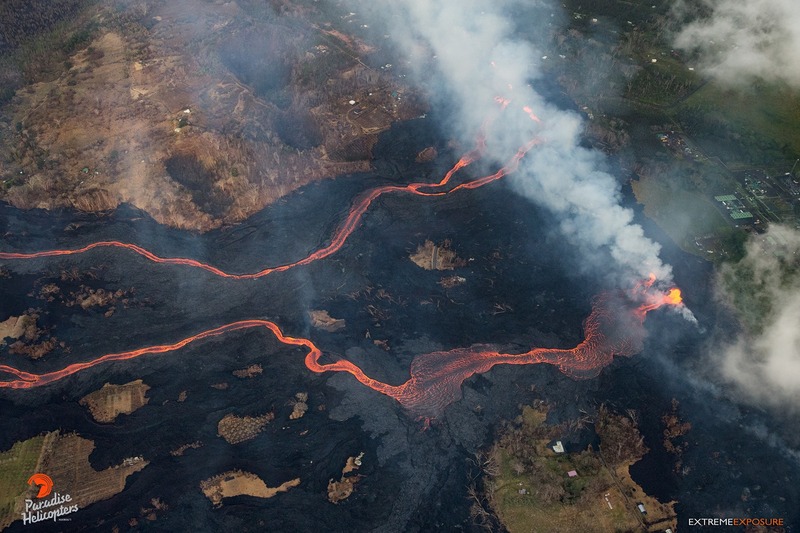 Sensors in the LERZ indicated that the lava ocean entries remained active overnight. There were three explosions from Overlook Crater (00:42am, 01:44am, and 05:00am) that produced ash clouds to between 10,000 and 11,000 feet above sea level. The National Weather Service Nexrad radar indicated that the clouds quickly dispersed. Several smaller explosions occurred over the course of the night. Moderate trade winds were blowing to the southwest and light ash fall likely occurred in downwind locations. Earthquakes in the summit region continued at a moderate rate overnight. The earthquakes and ash explosions are occurring as the summit area subsides and adjusts to the withdrawal of magma. Vigorous eruption of lava continues from the lower East Rift Zone fissure system in the area of Leilani Estates and Lanipuna Gardens. As of this morning, almost 2400 acres have been covered by new lava. Fissures 22, 6, and 13 are feeding lava flows moving southeast to the coast southwest of Pohoiki. At midday today, two ocean entries were active. Over the past 24 hours, channels feeding these ocean entries have diminished somewhat in vigor, however the laze plume generated remains significant. Fissures 7 and 21 are feeding an ‘a’ā flow that has advanced to the northeast and this afternoon crossed Pahoa Pohoiki Road onto PGV property. 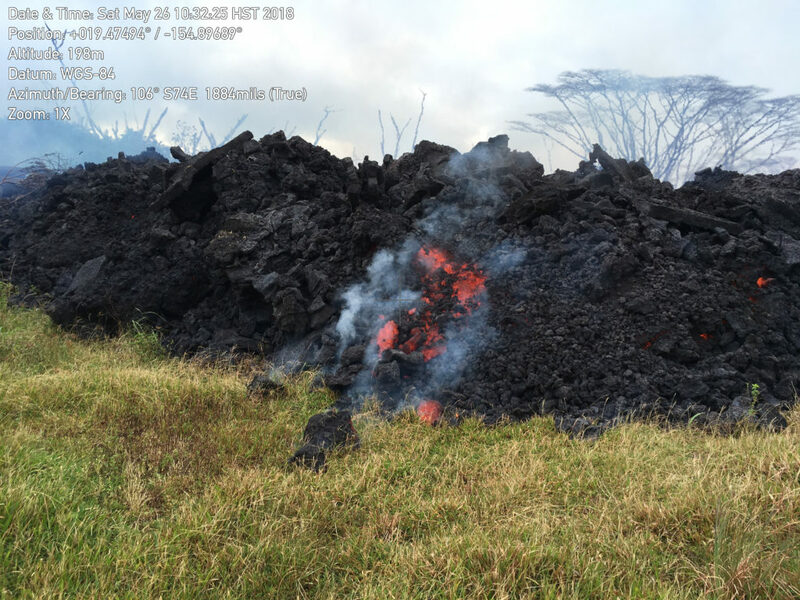 This ‘a‘ā flow, erupted from fissures 7 and 21, was approximately 3–4 meters (yards) high at the flow front and slowly advancing to the northeast in the Leilani Estates subdivision around 10:30 a.m. HST today. Volcanic gas emissions remain very high from the fissure eruptions. Trade winds are expected to diminish Sunday evening and the area impacted by vog could expand. Ash continued to erupt intermittently from the Overlook crater at the Kīlauea summit. Observations from the ground and by UAV during the past week have documented retreat of the Overlook crater wall due to collapse of the steep enclosing walls and rim. During the most energetic event of the day, ash from Overlook crater rose as 12-13,000 feet above sea level based on National Weather Service radar. Trade winds took the ash clouds primarily to the southwest. Trade winds are expected to diminish Sunday evening and communities around the summit area could see ashfall. Photos : USGS , Pam Mizuno, Bruce Omori. 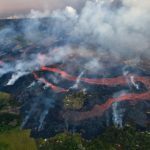 Videos : Big Island Video News , USGS. In the last 24 hours, through the monitoring systems of the Popocatepetl volcano, 48 low-intensity exhalations accompanied by water vapor and gas have been identified, as well as 37 minutes of low-amplitude tremor, two volcanic earthquakes. tectonic, at 16: 10h yesterday and 02h39 today, respectively with magnitudes of M2,2 and M2,3, as well as four explosions yesterday at 21:09, and today at 4:17, 05:33 and 07:06 h . The first, and most important, released incandescent fragments at a height of 400 m above the crater, most of which fell back into the crater, and generated a column of ash and gas of 3 km, directed towards South. From this morning until the moment of this report, we observe a constant emission of water vapor and gas, which the wind disperses towards the south. CENAPRED urges not to approach the volcano and especially the crater, because of the danger of falling ballistic fragments and in case of heavy rains, to move away from the bottom of the ravines because of the risk of landslides and flows mud. The volcanic warning light of the Popocatepetl volcano is located at Amarillo Phase 2. Fig. 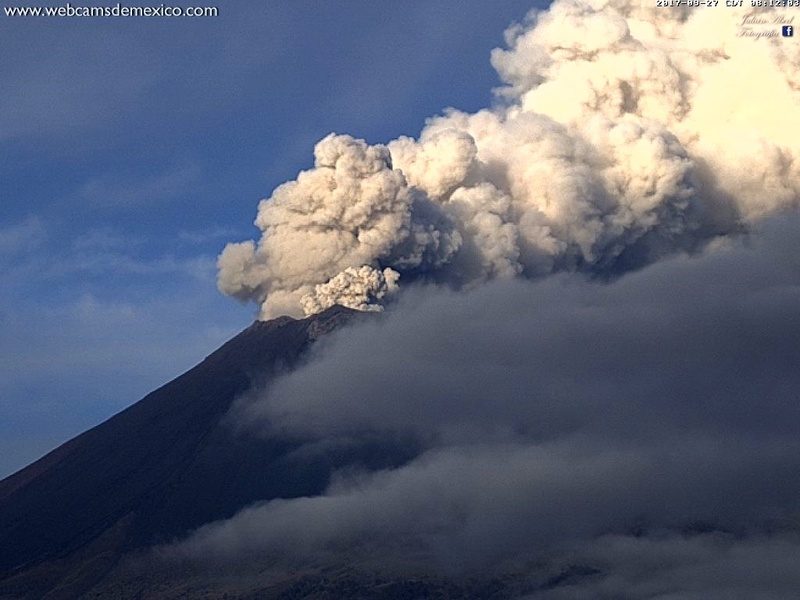 1 The vibrations of the San Miguel volcano continue below 100 units. At present there is no evidence that the seismicity between Chirilagua and Intipucá has an influence on the activity of the volcano. 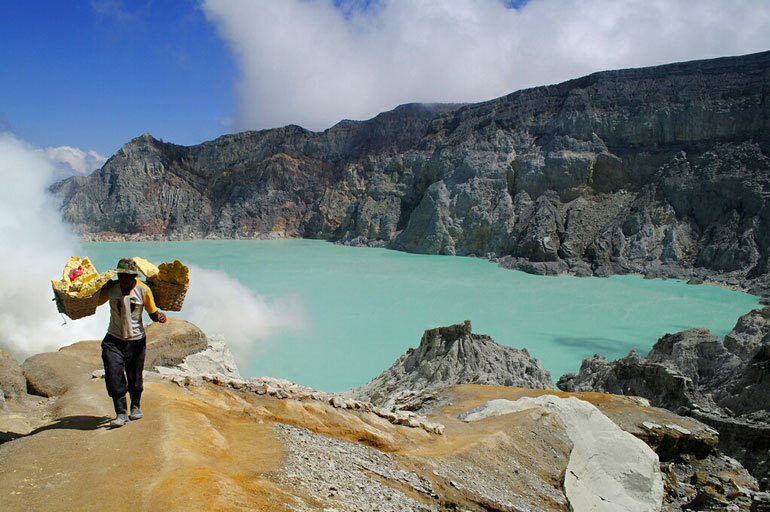 However, being an active volcano, it is possible that in the future it may present anomalies such as emissions of ash, gas, such as in previous years. The images show abundant meteorological cloudiness on the volcano, and prevent the view of the crater, also conceals the degassing (Figure 2). Figure 2. State of San Miguel volcano this Friday, May 18 at 10:06. Measurements of the sulfur dioxide flux released during the year show fluctuations, but the overall trend is downward. (Figure 3). Figure 3. Sulfur dioxide flux during 2018. 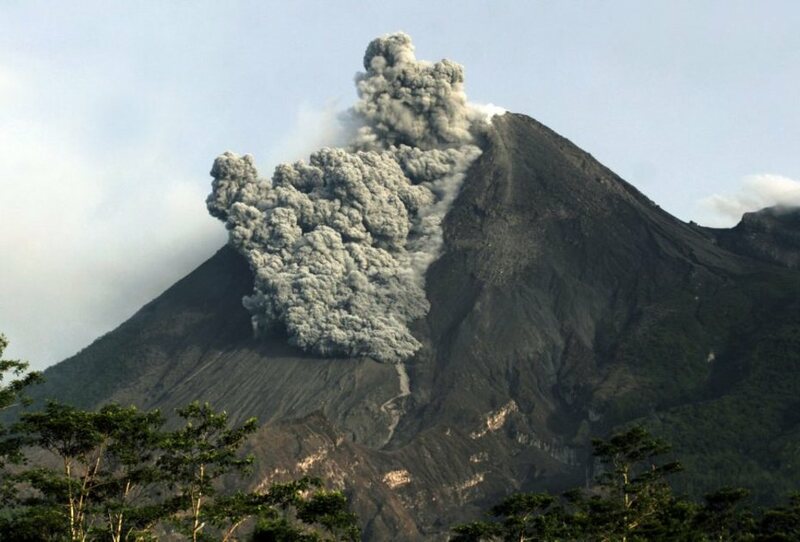 According to the monitoring carried out, the seismic activity of the volcano remains low. However, the Chaparrastic is an active volcano, so it is possible that future changes occur its behavior with emissions of gas and ash. MARN continues the systematic monitoring of the volcano and maintains close communication with the Directorate General of Civil Protection and local observers. In addition, he calls tourists and mountaineers to stay away from the top of the volcano due to sudden changes in his behavior. Source : Snet El Salvador. 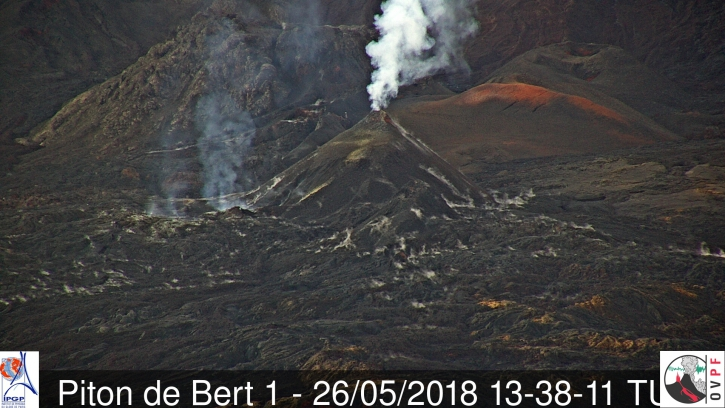 The eruption started on April 27, 2018 at 23:50 local time continues. The intensity of the volcanic tremor (indicator of eruptive intensity on the surface) continues a very slight decrease in recent days. – Lava flows occur almost exclusively in tunnel. Degassing remains visible on the main vent. 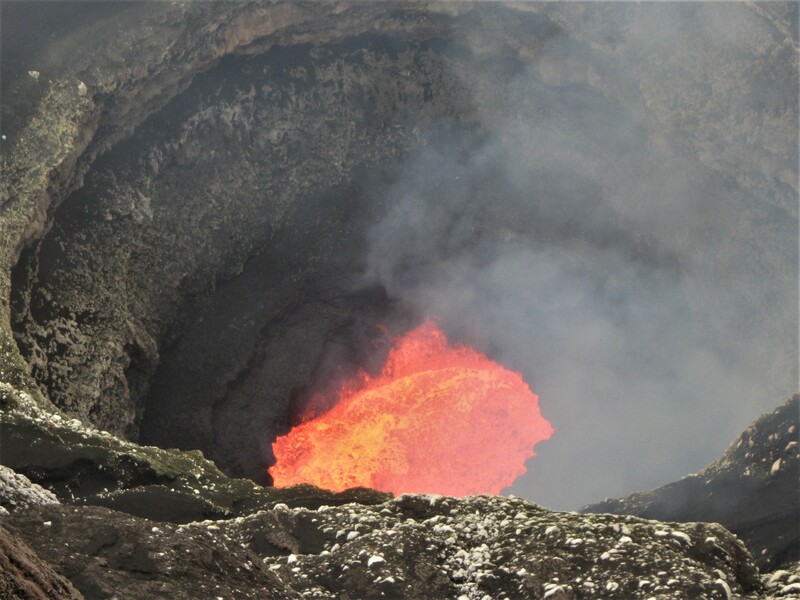 – No volcano-tectonic earthquake has been recorded during the last 24 hours under the Piton de la Fournaise volcano .